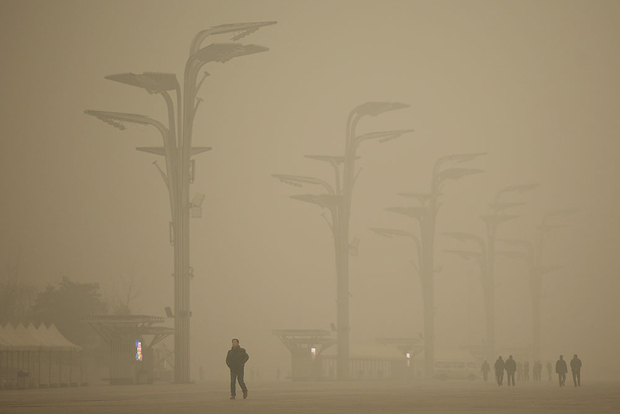 Olympic Park, shrouded in heavy smog earlier this month in Beijing. This piece was first published on the NYR Daily on December 8, 2015. This was a change. Over the past years our group has always practiced, no matter how bad the air. The city’s first major “airpocalypse” was in 2013, when Beijing’s Air Quality Index hit 755 on a scale of zero to 500. In an infamous Twitter post, the U.S. embassy called it “crazy bad.” But it wasn’t so crazy that Mr. Zhao cancelled martial arts practice. Last month was no different. On November 30, it reached 611 but they practiced. On some of these days I would make excuses and not show up. On others I would wear a face mask and then take it off before I arrived—no one else, of course, was wearing a mask and I self-consciously felt like the foreign know-it-all to show up with one on. These were drastic measures but sensible—and in complete contrast to how the government has handled previous air crises. When the U.S. embassy began monitoring air quality and posting its results on Twitter, the government’s Xinhua news agency criticized it as “inaccurate” and “unlawful.” During the late-November attack, a local Greenpeace activist wrote an article criticizing the local government for not issuing the red alert. If 600 wasn’t enough, then what would it take? The article circulated widely on WeChat, but was soon erased. And yet the government seems to have gotten the message this time and implemented the strict policy. This reflects what appears to be a growing awareness by Chinese officials that this is a real issue for ordinary people. This awareness began to result in concrete policy changes. By late 2012, the government had set up its own monitoring stations across China. Two young Chinese app designers came up with what I think is still the best app for measuring air quality, China Air Quality Index. It has measurements for 411 cities across China, allowing one to watch, in almost pathological detail, pollution clouds sweep across the country. Around that time I talked to the developers. They said that most of the downloads were probably from foreigners, but they noted that more and more Chinese seemed to be downloading. This feeling was reinforced in 2013 when I spent a couple of weeks in what was then China’s most polluted city, the steel city of Handan. The dubious distinction has since moved slightly north to Baoding, but both cities are similar for lying in the middle of the highest concentrations of steel production in the world, all powered by coal. As I wrote in an article then, discontent was growing even among steel workers—the people whose jobs were on the line. I was especially struck by an official I met from the local Communist Party school. She told me that the Party realizes that discontent is growing and is instructing officials to make sure that factory pollution controls really were being used—and not just purchased and switched off to save money and increase production. Does any of this have relevance for the Paris climate talks? I think so. The (overwhelmingly) men who run the Chinese government may be authoritarian, but climate-change deniers they are not. They are too technocratic for that; for them, it has always been a very hard-nosed political calculation: burning less coal and shutting down industry is costly and potentially destabilizing. If you—the West—want this done, you help us pay for it. It matters more to you than to us. This is still China’s position, but the wave of pollution sweeping through the capital makes it harder for Chinese negotiators to play hardball. If the negotiations are seen to fail because of China’s intransigence, that will filter back to Beijing through the haze of censorship and, slowly, create resentment. It won’t lead to a political code red, but will be another cause for dissatisfaction in a country where the economy is already slowing. As perverse as it might be, the Chinese capital’s airpocalypse may be in its best long-term interests.